For a segmental retaining wall to be properly reinforced, grid placement is key. 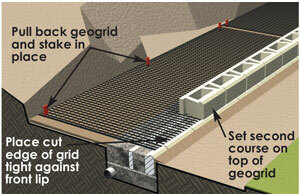 The first layer of geogrid should be placed on top of the base course of block. This way the geogrid starts at the bottom of the wall where the most pressure exists. Beyond this point, 2 course spacing or 16 in (40 cm) maximum spacing provides the best overall performance of the reinforced structure.